Welcome to the second ship design contest! Last year we held our first contest for people with a talent for unorthodox and innovative ship design. This time we have new prizes, an improved ship designer in Fleet Battles and just a little bit of alien oversight. Read the contest details below. 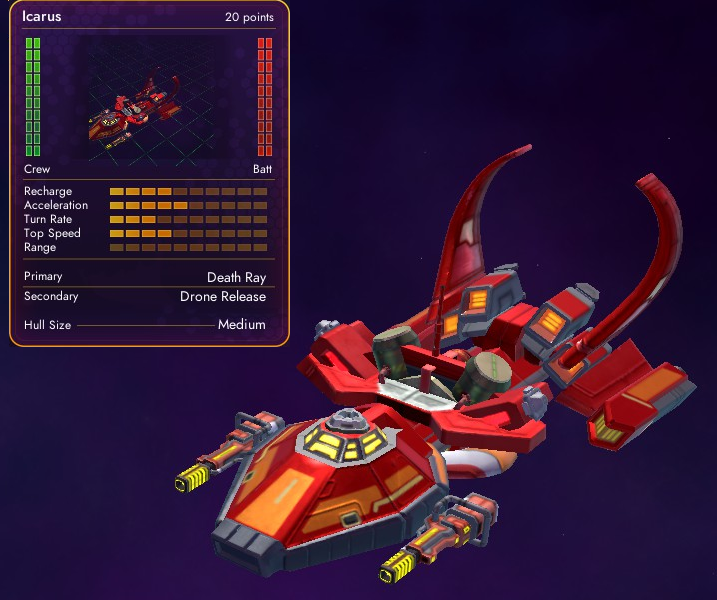 Create your amazing ship design in Star Control: Origins – Fleet Battles BETA. Upload it to the Steam Workshop. Submit your entry to this thread with a link to the Steam workshop file. 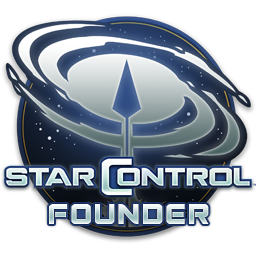 This contest is open to all owners of Star Control: Origins. You must be a legal adult in your country of resident (i.e. 18+ in the United States). You must have a Stardock account (free). All entries must be submitted before 6 PM EDT, August 20th, 2018. All entries must be original, (cannot be duplicate of any current ship). Any entry that appears to violate any copyright or other IP rights will be rejected by Stardock’s discretion. No vulgar or harassing submissions will be accepted. 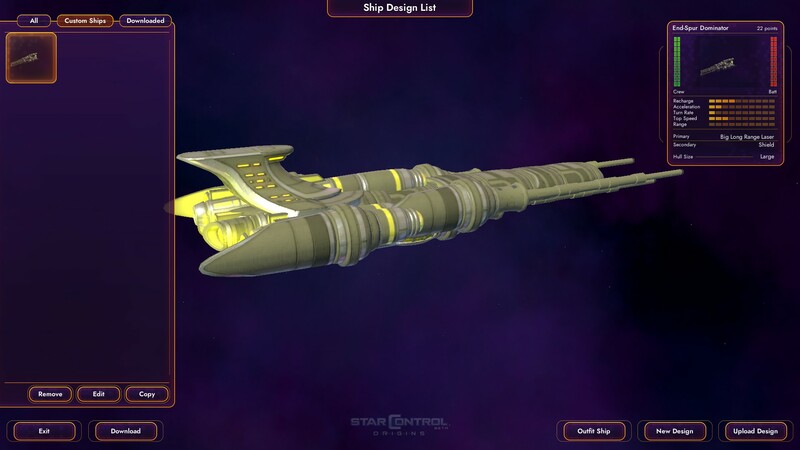 The author of an entry agrees to grant Stardock a perpetual right to use, modify and redistribute the ship in any Stardock product of promotion as they see fit. Your ship must be an original design of your own making. It must be fully viable in multiplayer and single player. You must use the standard set of parts and modules in game. No custom XML modding. Only submit one ship design for consideration. Make it your best one! Judges will be Stardock or/and community members that have not participated in the contest. 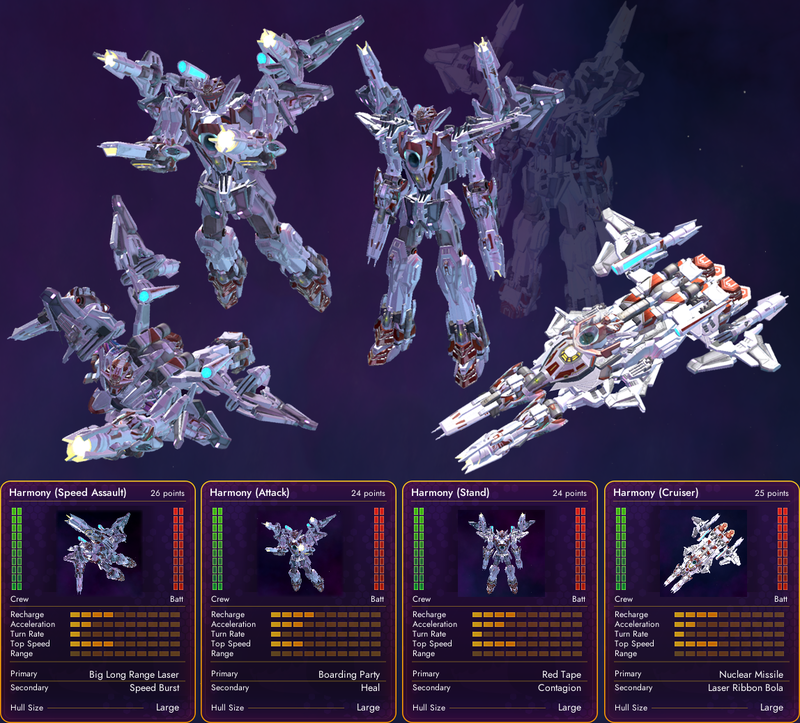 These 3 winners will have their ships included in-game. Up to 10 runner-ups will be included in a community spotlight. Ships will be judged for three criteria; Look, Feel and Balance. Stardock reserves the right to modify these rules at its discretion. This event must have at least 3 entries to be considered viable. This Contest shall be governed by and construed in accordance with the laws of the State of Michigan. To the maximum extent afforded under the law, the parties hereby agree upon, and submit to, the sole and exclusive jurisdiction and venue for all lawsuits arising from or related to this Agreement (or the performance of a party hereunder) of the Michigan Courts located in Oakland County, Michigan, and to the Federal Courts of the United States of America located in Wayne County, Michigan. This Contest is void where prohibited by law. The design is not perhaps the most interesting in the world, but the concept could have interesting applications. 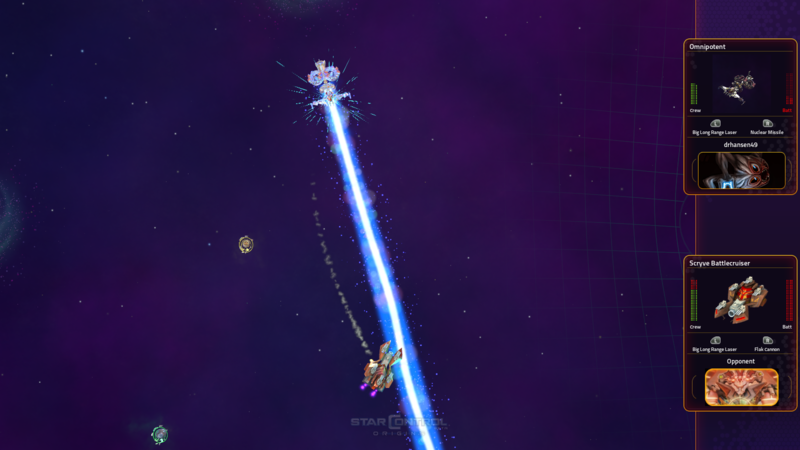 It's not particularly points effecient in fleet battles by virtue of only having self-destruct as a weapon and speed boost, but it would discourage anyone from coming near you while you collect pickups with speed boost. I found it quite fun to use, but naturally it doesn't live very long. 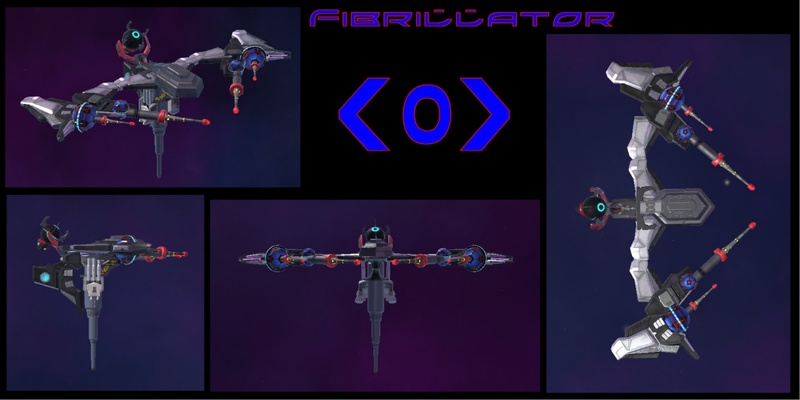 The Fibrillator is a close combat vessel that attacks by arching high ammounts of energy through specialized inductors. These arcs are very mellee ranged and given that the Fibrillator is not a very fast vessel due to its medium size, is the secondary attack supposed to catch up on fast enemies. Fibrillators replicate and deploy CADs (Conductor Anchor Drones). The electromagnetic accelerator behind the Fibrillator (the CADapult), fire a drone fast forward, where it then tries to attach itself to enemy vessels. Once attached, it will try to slow down the vessel, untill the Fibrillator can come in range, where it then connects with filament wires that are also directed via electromagnetism. The wires attch to the front of a Fibrillator. If The fibrillator then manages to aim its energy arcs onto the wires, the energy gets directly routed to the enemy, damaging it directly. 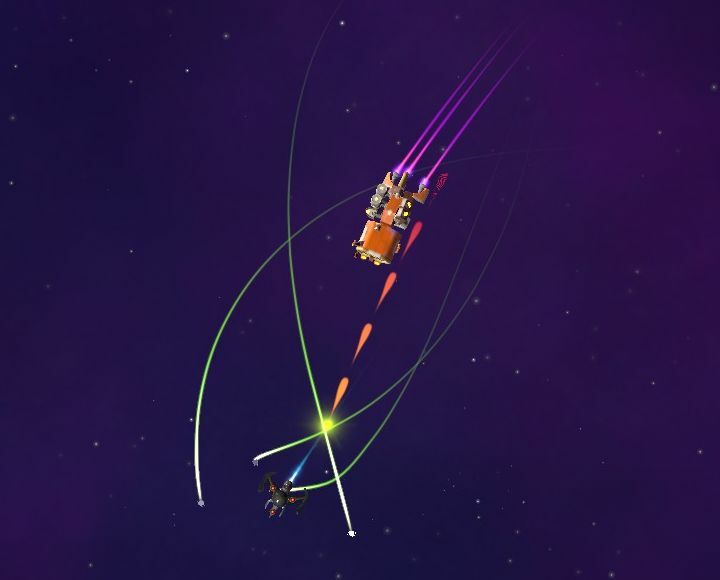 Enemy vessels that have no direct defensive mechnisms (Like Flak cannons or point defese lasers) can mange to get rid of an attached CAD by colliding the drone with an asteroid or other object. 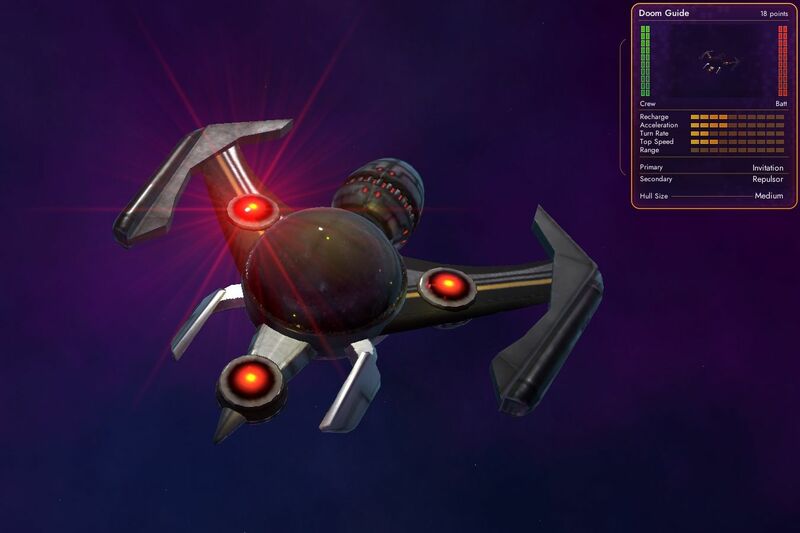 Given that these magnificent weapon abilities are currently not integrated in StarControl:Origins, he currently equipped with the ray carver from the Mowlings as primary weapon and the red tape from the Measured as secondary, to represent its abilities somewhat. The T'mpar are an enigmatic race of explorers and historians. The only known references to them are held by a group of Mowling seers. It is said that their ships have the ability to use a "phase shields" allowing them to avoid damage during combat and exploration. This gives them the ability to explore areas not accessible to other races. While a peaceful race, they understand that sometimes diplomacy requires a hammer. So they equip dual phasic cannons, that produces moderate damage to targets. The ship is highly automated so the crew compliment is lower. The "nodes" act as both ambient energy collectors and phase shield emitters. Project Harmony, collective wisdom of Alliance. Wish to bring the true peace though out the universe. The project can only be activated by full agreements from all members of Alliance Council. Harmony Force is only active for peace keeping missions. The Doom Guide approaches, whispering promises of ascension. Only a few fortunate souls will hear the call of doom. The chosen would do everything in their power to jump ship and join the Doom Guide, as the unworthy, remaining in their unclean vessel, are forcefully rejected. May they be deemed worthy upon the Doom Guide’s return. I think that the combination of Invitation and Repulsor is quite OP in human hands against the AI – I can usually defeat the entire default Alliance and Scryve Empire fleets under a crazy cyborg control with only one or two Doom Guides, but I don’t know how it would fare against another human. A good counter to the Doom Guide would be a fast ship with long-range capabilities. Pictured below: A Doom Guide leading its flock of ascendant Drenkend to their destiny. Background: Khmeli, a scientifically apt dendroid starfaring race, are known for their frantic search for any data on planetary systems with brown dwarfs. Khmeli seem obsessed with an idea of utilizing brown dwarfs as an energy source for their future colonies. Ship: Mesoform is an aggressive scout-class military ship. Despite its tiny size and small crew compartment, it can hold its own in any situation. 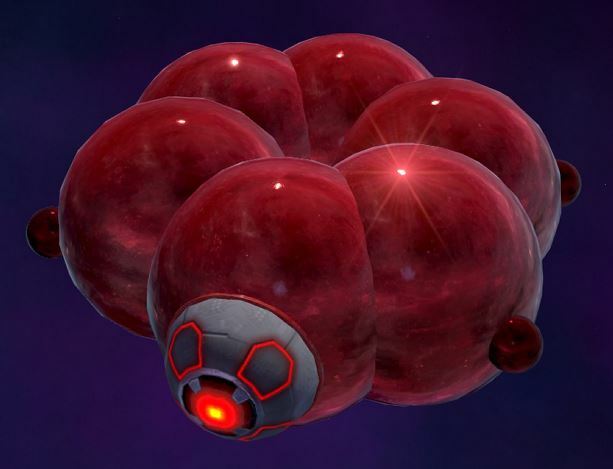 It is equipped with the leetest tech the Khmeli could squeeze into this chlorobenzene-molecule-shaped glistening marvel of design. High energy storing capacity of this mesoformic construct allowed to equip it with the devastating pulsar-halo primary weapon and defensive repulsors, as well as the adequately capable engine and thrusters. 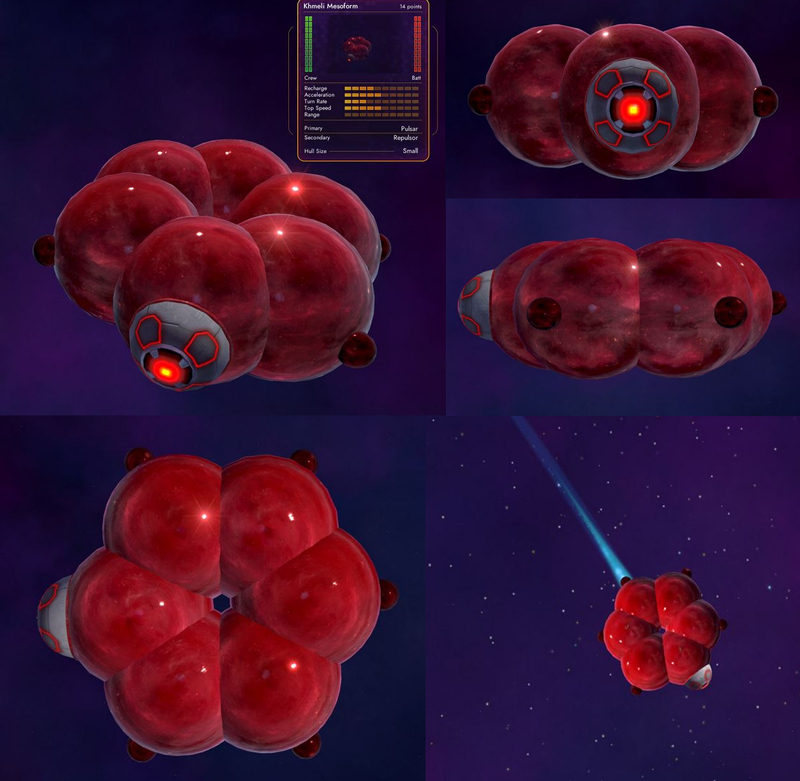 Solitary Mesoforms or their small squadrons are usually encountered in Hyperspace scouting for new planetary systems or accompanying civillian Hyperlabs in their tasks of scanning gas giants and brown dwarfs. Everyone's ships are looking great! Incidentally, curse this only-submit-one stuff; I have way too many to choose from! 18 years in the making!!! Ok, real life backstory. 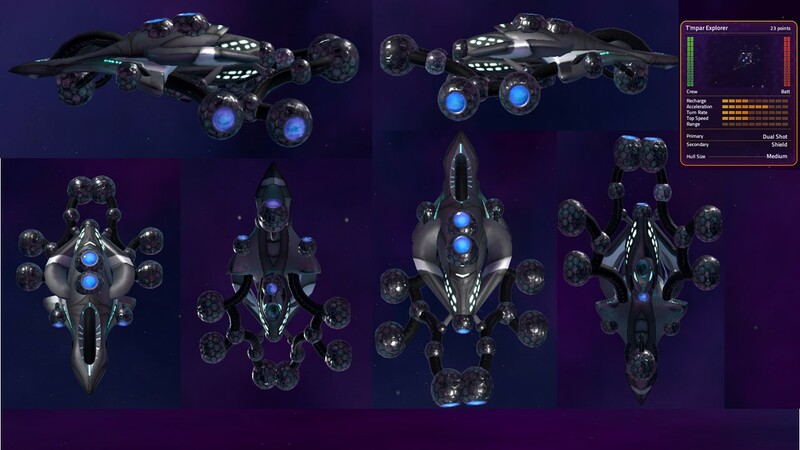 Around the year 2000, I wanted to design unique looking star ship for my own sci-fi universes, game mods and such. Something "cool" looking, but different enough from the standard looks of ships. Something unique and identifiable. I drew inspiration from various sources, the White Star from Babylon 5, the Millennium Falcon (I wanted it slightly asymmetrical) , and ironically lots of Chmmr Avatar and Precursor Flagship inspiration in her. (For the contest and the universe, I hope it is not too much! It really does look the Avatar and Precursor Flagship had a love child!!!) 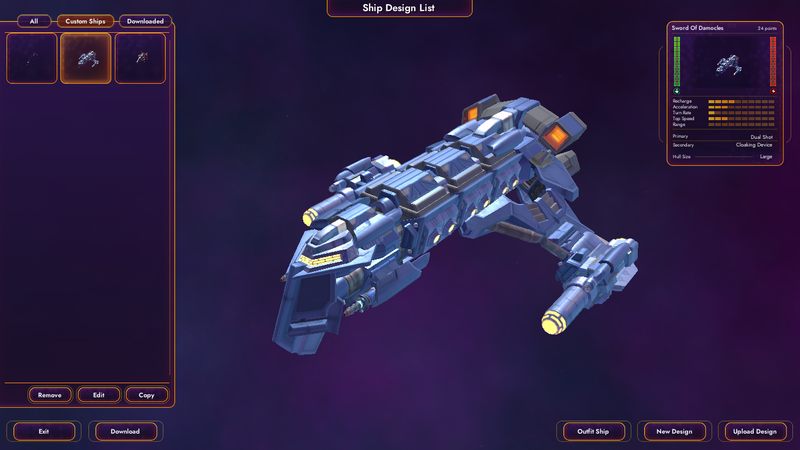 It was never intended for Star Control, but in some serendipitous way, I feel like she is coming home after 18 years. Background: Owned by a race that prefers isolation and keeping out of galactic politics. They will trade with others after some convincing. However, every few years, when the twin stars of their home systems align, they become extremely hostile (to the point of a completely different personality) and strike with a full out military offensive on a randomly selected solar system. Then the revert to their isolationist way as if nothing happened. (Earth scientists think it could be related to a mating season of sorts, or perhaps a religious ceremony.) Every now and then a straggler gets left behind wondering the void with no intention of returning to their homeworld with the claimed have been enlightened and freed. I just put a race in for fun. I am not that tied to the race nor is the ship. Ship: This Strike Ship is known for waiting at a long range then dashing in to make a point blank strike, then quickly retreating to a safe distance to repeat it again. Intended Playstyle: Hit and Run play style or a strafing run type play. It should be quick to accelerate, slow to turn. Equipped with a high powered forward facing weapon of shorter range. Primary: Anti-Matter Maul. 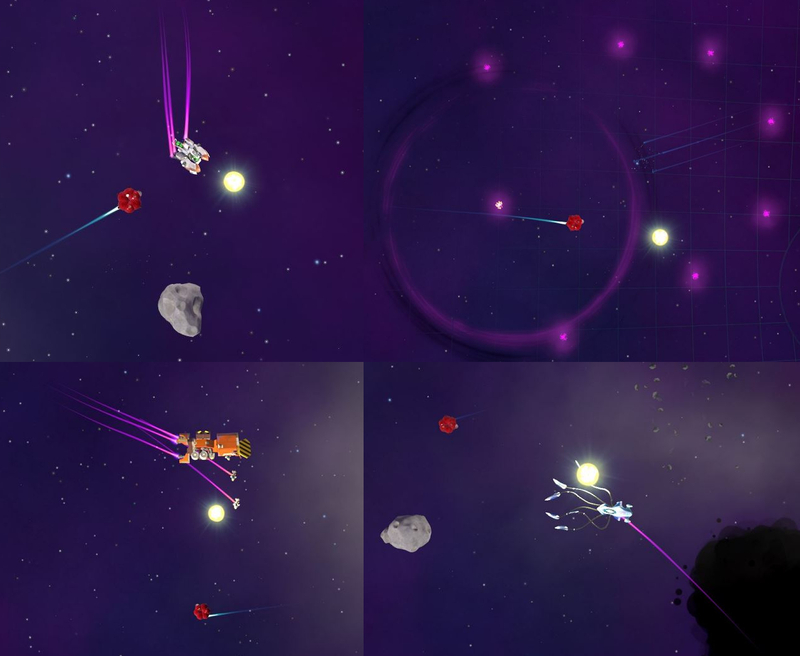 A beam weapon with shorter range than the Beam Carver, the longer it stays on a target the greater the damage per second becomes. 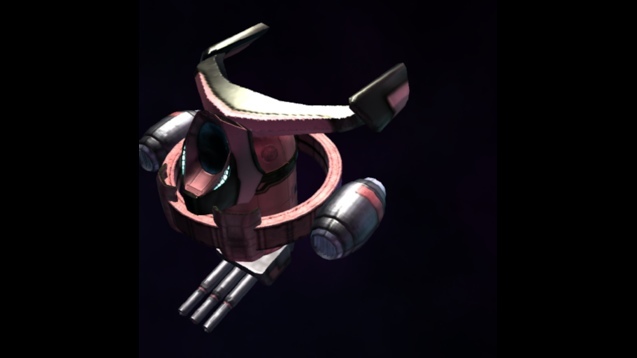 Secondary: Interdimensional Pull Drive (Immediately accelerates in a straight-line which ever way the ship is facing cancelling all inertia while activated. Then all previous interia is restored after it shuts off.) It would appear as a Purplish "flames" in front of the front wings. I removed the high speed engine to the basic so you are dependent on Speed Burst (It give more of the hit and run feel.) I exchanged the Beam Carver to Death Ray for a more offensive "punch". It is much more playable and a unique feeling ship this way. The Icarus is an exploration ship that also happens to pack a punch. It sacrifices some speed and some armor for added maneuverability so that it can deal with any sticky situation it might find itself while exploring the black void. Built by a race presumed to be located at the end of Orion's Spur, the Dominator is a rare sight indeed in the mid-spur region. Only a few of the large warships have ever been sighted as faint silhouettes within Hyperspace, and rarer still contacted by a Mid-Spur race. The appearance and even name of the Dominator's creators remains a mystery as they never directly communicate, instead using proxy probes and artificial vocal emulators for communication. Any ship that gets too close will find itself in awe of the destructive power of the Dominator, for a few seconds at least. The main and solitary armament of the End-Spur Dominator is a powerful laser on par with those aboard Scryve Battlecruisers. 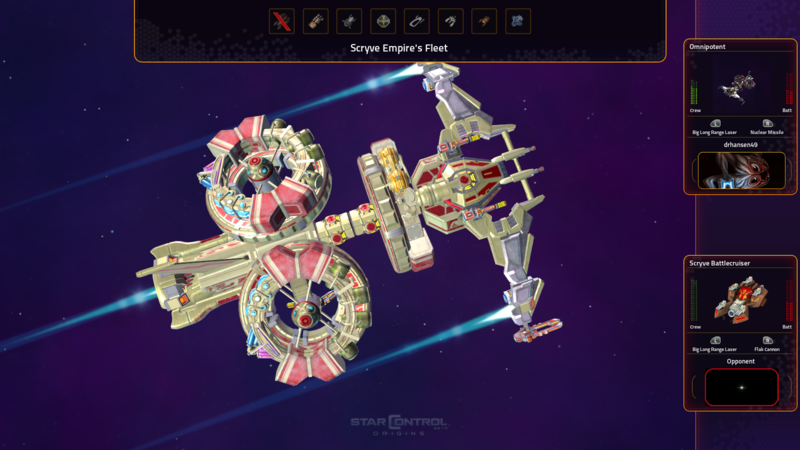 While no secondary weapon systems exist, the ship is equipped with a shield generator capable of absorbing significant damage when activated, however at an extreme cost to the ship's energy reserves, potentially rendering it unable to fire it's main gun for a short, but exploitable period. 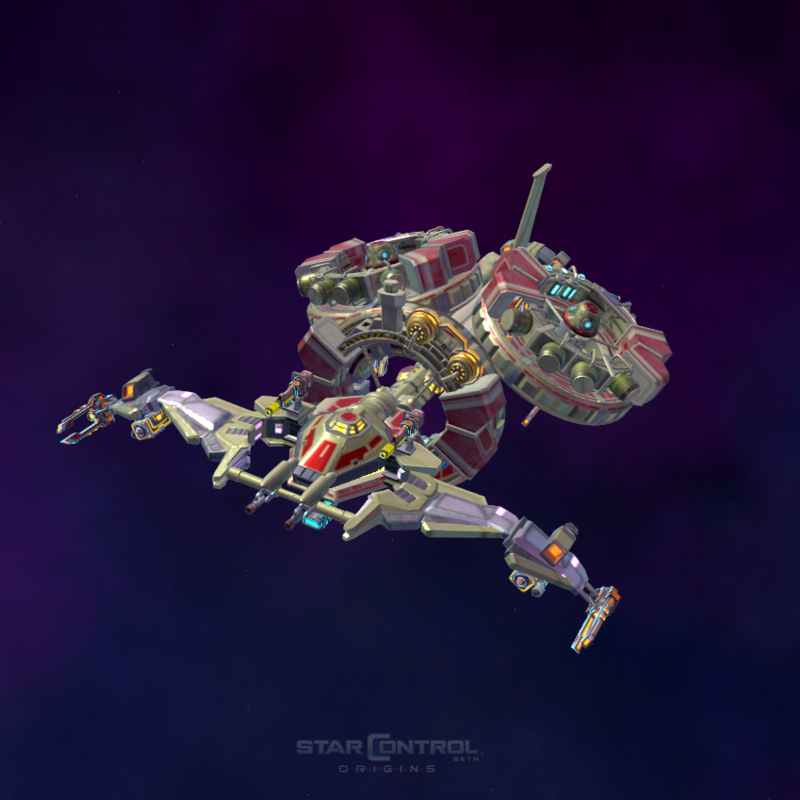 While powerful the Dominator should be wary of light, maneuverable craft that get too close, as well as races who employ fighters or wolf-pack tactics. 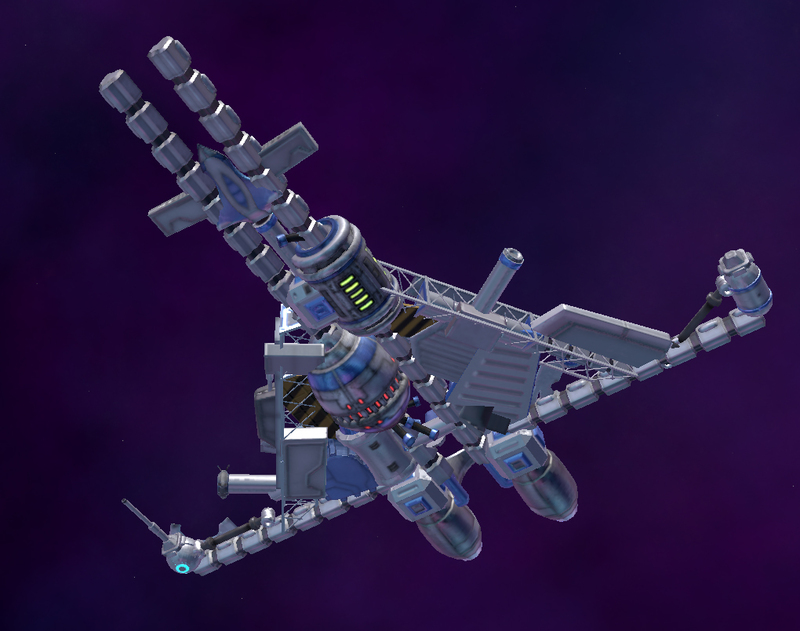 "This ship was coined "The Sword of Damocles" by Star Control because of its powerful cloaking device and its tendancy to appear out of nowhere and raid unsuspecting vessels. We have little information on what race controls this ship so for all we know it could be a pirate vessel, Lexite cabal, rogue Terran raider or an alien marauder. The ship however has a pattern: it raids those that transport certain artifacts or exotics. A victim ship disabled and boarded by the Damocles is subject to a stun gas that is able to pass through skin or breathing filters. A localised EMP burst is also used in conjunction to deal with any robotic defenses or entities. It does not employ these tools in combat however, which indicates that there needs to be a level of preparation time aboard the vessel to utilise these functions. After a few hours when the effects of the gas has worn off, hapless crew awaken to find at least one or more pieces of their inventory missing. Items reported stolen included but were not limited to: relics, paintings, luxuries, tech, specimens being researched, medical supplies, cinema libraries and cookbooks. We do not know whether this ship then sells these goods on but some of our mercenary "friends" have stated that the things it plunders are not entirely being sold on the galactic black market. Some have deduced that it might be affiliated with a private collector who has decided to expand their collection by force or the ship is in the hands of something that has a penchant for the arts. The Damocles also seems to rely more on raiding and leaving messages rather than outright murdering their opponents. Psychologists have put forward the idea that the owners of this ship desire it to be feared through this reputation alone and that by employing these mind games the Damocles has a greater chance of preserving whatever it is they are after. Defenceless crewmen usually request the offer to continue living rather than deal with a horrible death in space so it is more enticing for them to just give up and let the Damocles take what they want. Those wishing to put a bounty on the ship in revenge find that this is an almost impossible task for the Damocles spends a lot of its travel time shifting in and out of detection with its spacial cloak." "What we do know is that this ship has been known to dock in neutral ports or make shore leave rarely in frontier space and the design of the ship is reminiscent of some old, ancient design. Xenotechs have suggested that perhaps the ship itself is a trophy as rare as the things it hunts. Others say that it's likely the Damocles also restocks and offloads its plundered assets to a cloaked base somewhere. It appears to be incredibly technologically advanced and its tactics seem to rely on shooting enemies at a very long range with its twin ion cannons until they surrender. The ship also has a plentiful energy reserve that allows it to unleash a sporadic chain of firepower even while cloaked. Because of its size it can outlast most vessels in a fight yet it is not a ship that ideally can fight toe to toe with heavily armed and armoured ships such as Scryve Battlecruisers. Normally if the ship is caught in a bad situation it tries to avoid the encounter entirely by using its stealth technology. If it is forced into a confrontation however we assume it employs proverbial "cloak and dagger" tactics to maneuver around its enemies using powerful drive systems before raining searing, luminescent energy bolts upon its foes. Should the captain or entity of this ship be persuaded to aid Star Control it could serve as a powerful ally, although I doubt that diplomacy will be effective here. On the otherhand if the the vessel itself is disabled and towed to Earth by one of our ships where it can be "reprocessed" it would make for a good conversation starter (I know there are dozens of speculative xenologists who are itching to take a look at this thing and a few captains who would like to cruise with it to Jupiter). If we destroy it however, the galactic community will be able to sleep a bit more easier, plus we'd be able to get a look at some of its design features from the wreckage. 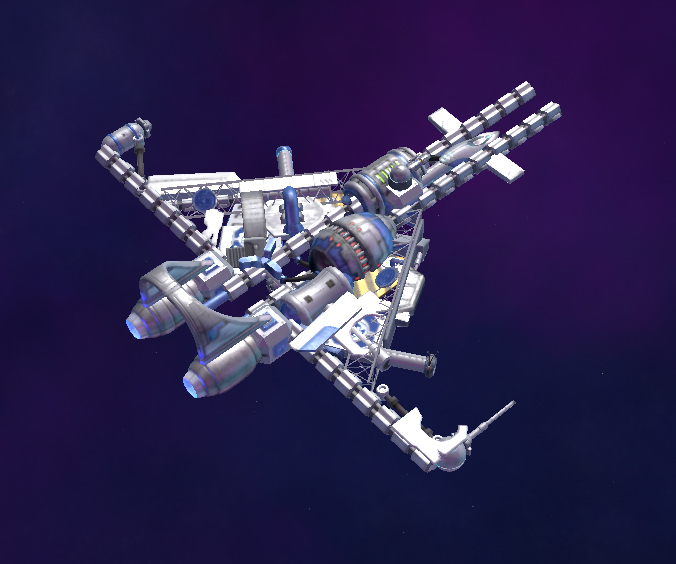 Star Control notes though that recovering it in this state would greatly reduce its value (and would lament the missed opportunity of examining the ship or its cargo) but nevertheless if it happens to be hostile then the Damocles should be treated as such." The Base is an mobile research station, most likely used for the creation of Mechanical-weapons and Biological-weapons, and the occasional Xenobiology study. Since it studies and most likely also produces weapons, it's well armed with an unique "double-laser" and protected by strong Shields. It's drawback is that the size and shape does not allow the ship to fly quickly or even turn with precision, so it relies on Probes to help with attacks and reconnaissance. It's unknown what species pilot the Ship. Bio-Scans shows NO Lifeforms. Sadly, my design is not uploading to the Steam workshop for some reason. I am assuming it's just a temporary glitch because I wasn't having any problems updating the design a couple days ago. Here it in a picture. I will try uploading when the problem is resolved. However, I may not get another chance before the deadline. This was my second attempt using the tool. I was trying to create something that was a shout out to the Vindicator. However, I wanted it to be more militarized and threatening in design. Back Story: Humanity’s second long-range ship program - the Omnipotent program - was designed as a military reaction to the newly discovered threat from alien civilizations. Shoring up existing nuclear technology, is a gigantic laser design acquired on a top-secret infiltration of a Scryve weapons facility. This ship boasts multiple turrets, increased capacity, a detachable hull, and escape pods to ensure survival against all odds. It’s a bird of prey that will tear enemies of peaceful exploration from the sky. A stock Terran fighter, written off because of battle damage and left in a scrap yard, it was 'liberated' and then repaired using various alien technologies. The 12B is infamous for it's surprising capabilities which seem to change after every battle. Not entirely structurally sound, extensive and constant maintenance is required to hold this collection of wishful thinking together. What works from one battle to another is as much a mystery to the captain as their opponent. Extensive damage to the ship only seems to trigger new abilities, which is probably the crew scrambling to get anything to work at that point, but it seems to always pick up a regenerative ability right before the end. The Terran government desperately wants to duplicate the success of this ship but lacks the genius level technicians required to be able to keep more than a handful functioning. W I tried everything from restarting my PC to submitting a different design. No matter what I can't seem to upload a file to the workshop. I found where I can access the design files on my C drive if that is a possibility. You can still upload a screen shot. That would at least be proof of your design and then keep trying to sort out the Steam side of it. Just a thought. You can zip the files and upload them here. We have now posted the winners here. Only an 'Honorable Mention"...? Awwww.